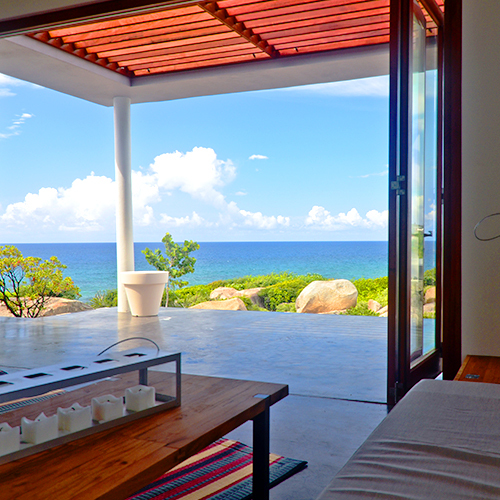 Quite simply, LaCantina Doors OPEN SPACES. 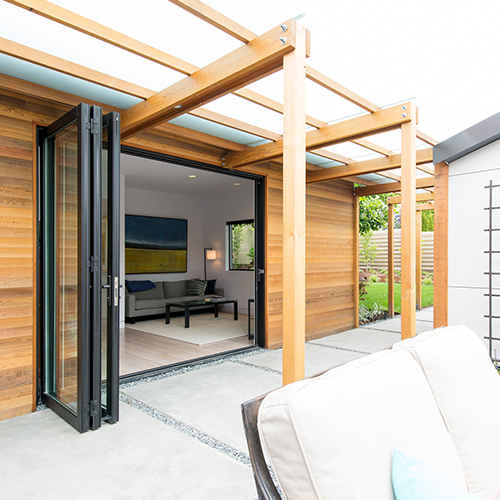 By eliminating walls and removing the distinction between the indoors and outdoors, LaCantina Doors transform your space, creating an environment of outdoor living. 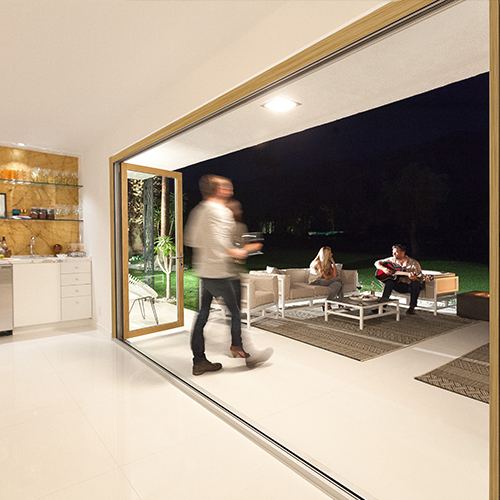 With innovative designs, LaCantina Doors products are preferred by designers and homeowners for their quality, clean lines and narrow door profiles that maximize your view as a glass wall when closed. We offer the most comprehensive range of material types and product options to suit the demands of both residential and commercial construction. Which LaCantina Door is right for me? 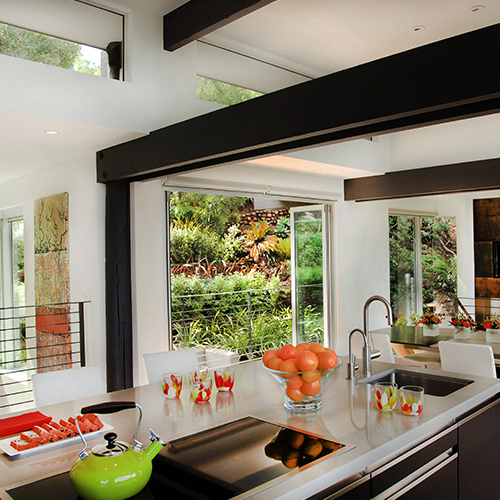 LaCantina Doors offer a comprehensive range of products to meet any application or architectural design. Choosing the right LaCantina Door system depends upon your personal style and budget. For the detailed product comparison chart, click here. Contemporary design, aluminum construction, narrow 2 3/4” stile and rail profile. 1 3/4” thick panels, and concealed multi-point locks throughout. A cost-effective product and our narrowest design. Contemporary design, proprietary aluminum construction and fascia technology with thermally efficient core, our signature 3 15/16” stile and rail profile, 2 1/4” thick panels and concealed multi-point locks throughout. Upgraded features for higher thermal performance demands and maximum design flexibility. Contemporary to traditional design, proprietary aluminum construction with interior real wood fascia, our signature 3 5/8” stile and rail profile, 2 1/4” thick panels and concealed multi-point locks throughout. Upgraded features for increased structural performance for large openings requiring oversized panels. 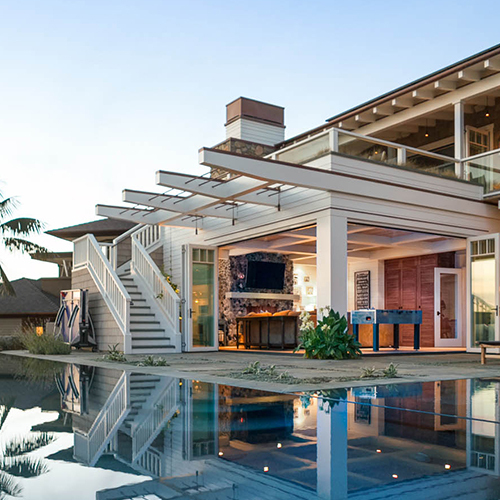 Contemporary to traditional design, engineered wood core construction with exterior aluminum cladding, square or sculpted signature 2 15/16” stile and rail profile 2 1/4” thick panels and concealed multi-point locks. Our most versatile and energy efficient system. High-quality contemporary design, vinyl construction, our signature 2 15/16” stile and rail profile, 1 3/4" thick panels and concealed multi-point locks throughout. Our most cost-effective product. Traditional to contemporary design, solid core wood construction, our signature 3 5/8" stile and rail profile. 1 3/4” thick panels and exposed flush bolts. A timeless classic. Contemporary design, proprietary aluminum construction, and fascia technology with a thermally efficient core, our signature 3 5/8” stile and real profile, 2 1/4” thick panels and concealed multi-point locks throughout. Upgraded extreme weather protection and safety features and a DP70 rating. Our highest performing product. 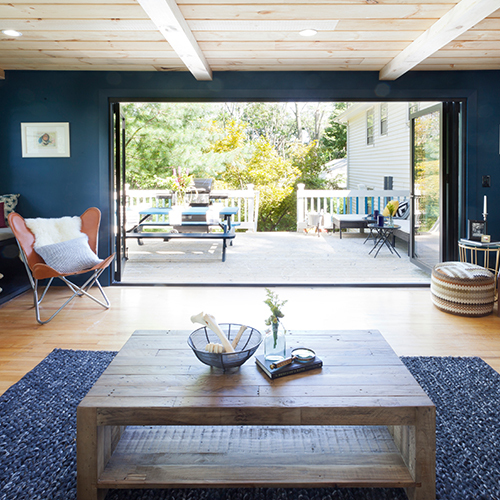 Are LaCantina Doors weather tested? We have performed weather testing on all our doors at independent test facilities. 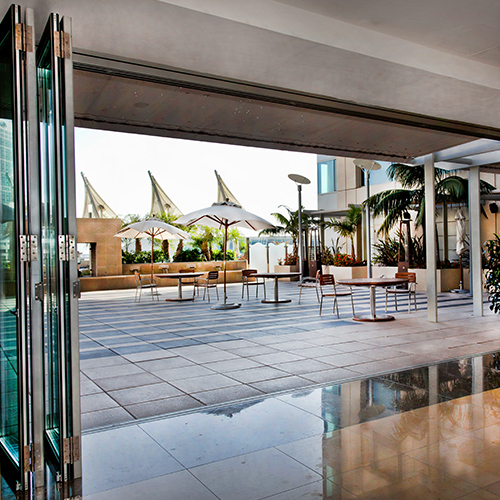 Air, water and structural performance results achieved mean LaCantina Doors can be specified for use in most areas. Important factors to consider include building code requirements, project location, the type of building , etc. Please refer to our test results and consult with your architect or engineer. What is the warranty on my LaCantina Door system? We take pride in the quality and performance of our products and stand by them. In support of this, we offer a 10 Year Limited Warranty on our door systems and 5 years for screens. Refer to our warranty page for further information. 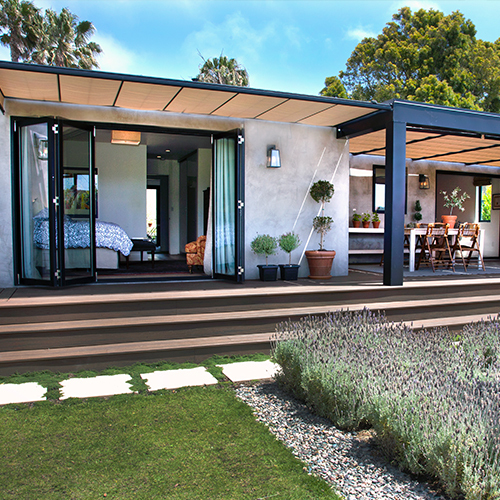 What does the LaCantina Doors system include? 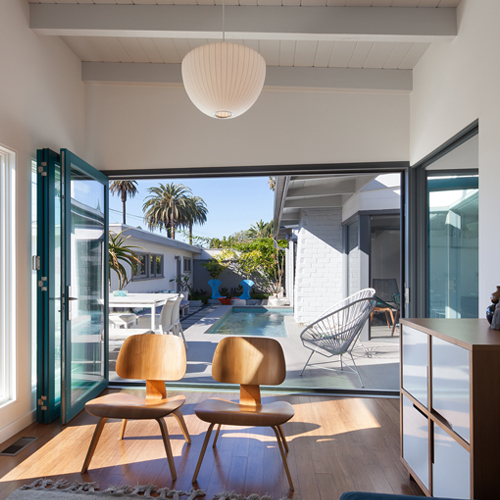 All LaCantina Doors are sold as complete systems ready for installation and include the frame, threshold, weather-stripping, doors, glass, hinges, rollers and multi-point lock and lever handle for the daily passage door. Installation instructions, installation screws and drill bits are provided. Materials not supplied by LaCantina but recommended for installation include self adhesive flashing, shims, a sill pan, sealant, foam filler and caulking . Tools not supplied by LaCantina but necessary for installation include a Flathead and Phillips screwdriver, a hex head insert with an extension bit, a drill and a level. What sizes can LaCantina Doors be? Can you do custom sizes? We offer “made to measure” door systems to fit any opening. 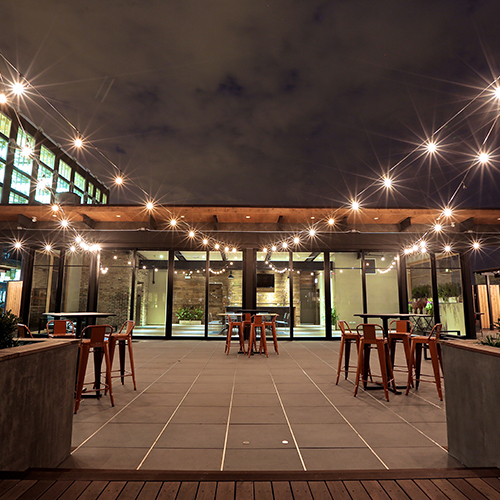 Large openings up to 52 feet wide with 8 doors opening in each direction are possible. 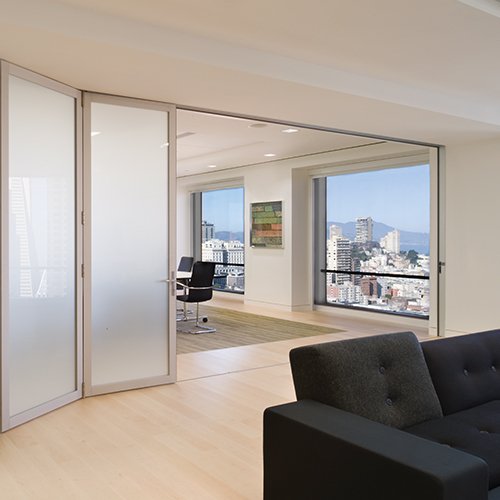 Door panels can be up to 39” wide and 10'0" tall, without the need for horizontal mullions that detract from your view. We specialize in combining two systems for post-less or “zero post” corner applications. Larger sizes and other custom options including a Window Door Combo are available upon request. What are the frame depth options? 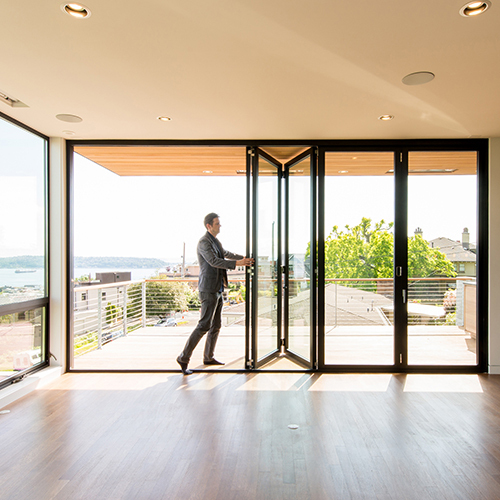 The overall frame depth for our folding door system is 5 5/8” wide, suitable for 4 9/16” wall conditions. We offer 2” wood jamb extensions to the interior on our aluminum wood, clad and all wood systems. Custom extensions are typically supplied by your finish carpenter. 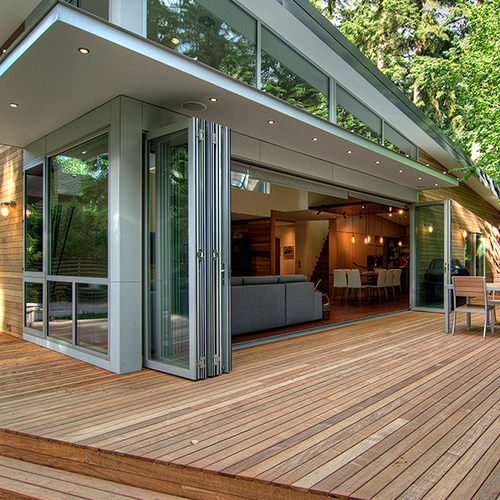 Speak with your contractor regarding how your LaCantina Doors frame will be finished to the interior and exterior. What exterior aluminum clad colors are available? Our in-stock colors are white and bronze. We can also custom color match most powdercoat or paint colors of other door and window manufacturers or custom match your own unique color. 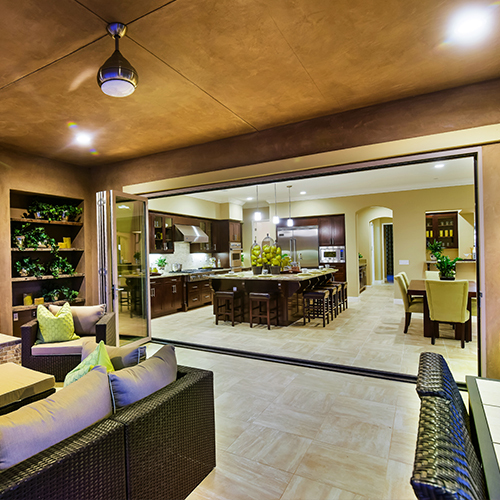 Your LaCantina Doors system either stands on its own as a feature or matches your door and window package color. What glass options are available? Can I get energy efficient glass? 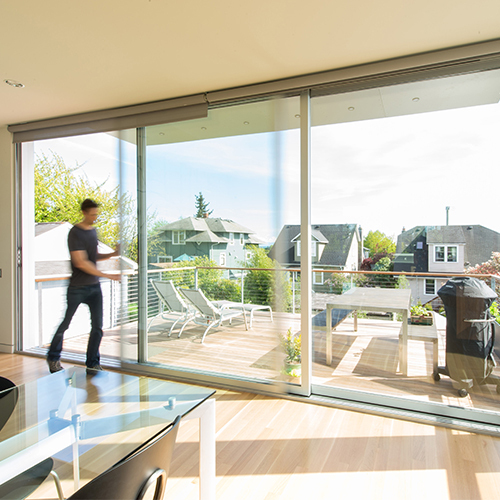 All glass is insulated and tempered and we offer Low-E glass as standard on all LaCantina Doors Systems for greater energy efficiency. Custom glass is available with any order, including tinted, obscure and laminated glass. We also offer triple glaze and other options for high energy performance to meet the necessary and demanding energy codes found in the industry today in all geographic areas . We offer two in-stock wood species: Vertical Grain Douglas Fir and African Mahogany. We also offer multiple other species for Custom Orders. Popular custom wood species include Pine, Alder, Oak, Maple, Cherry and Walnut. What is recommended for finishing of wood? All wood component parts and finishes must be inspected annually for damage resulting from exposure to the elements and repaired immediately. All wood on doors and frame is stain grade and is supplied unfinished so you can achieve your own desired finish result to suit your project. For best finish result, we recommend carefully removing select hardware as getting sealant on the hardware may result in damage. The following are recommended wood finishing tips. However, please rely upon your wood finishing professional and the guidelines provided by the coating manufactures for final instructions. To prevent wood swelling and warping due to changes in temperature and moisture, all wood surfaces must be have a top quality finish applied within seven (7) days of receiving. It is recommended that all wood finishing is done prior to installation of your doors. 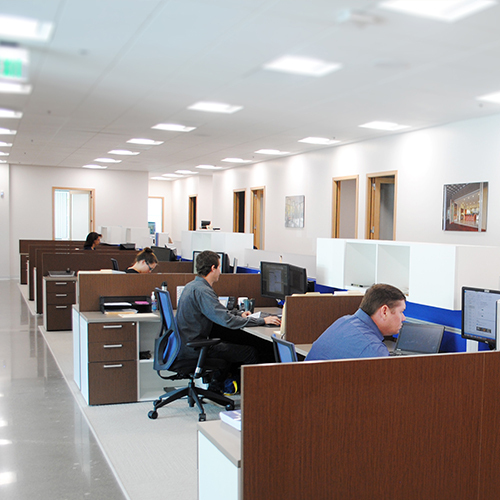 Finish your wood in a workspace that provides adequate light, is well ventilated and is dry and warm. Prep the wood before finishing by sanding it to remove any minor nicks, scratches, debris, surface glaze, etc. Sanding not only helps to smooth out the surface but it also opens the wood pores to accept more stain and finish, resulting in a richer, deeper color. Paints, stains and clear finishes may be applied with clean rags, cheese cloth, brushes and other applicators. For best results, choose the right applicator. A two step finishing systems is recommended for enhanced beauty and preservation. First paint or stain the wood and then apply a clear protective finish. Allow the paint or stain to adequately and properly dry in the recommended amount of time before applying the clear finish. Applying the protective finish before the paint or stain has completely dried may result in chipping, peeling, or bleeding of color. Periodically refinish or repaint your wood for long-lasting results. What hardware finish options are available? Choose from stainless steel or dark bronze hardware finishes. What threshold options are there? Can I have the flooring continue through the opening at the same level? 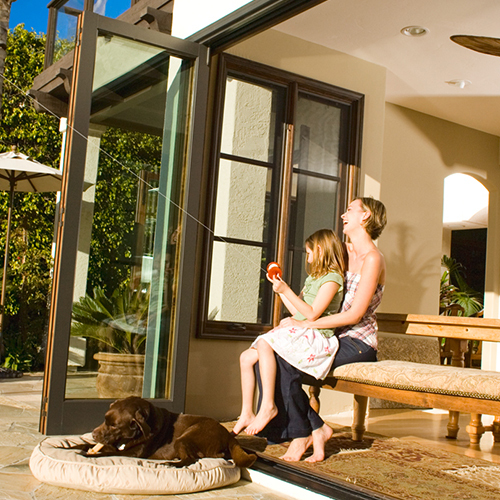 LaCantina Doors' standard threshold option incorporates a bottom guide, weather-stop and weep system. It is designed to weather seal against air and water. The threshold height is 1 15/16”. For the best transitions, we suggest recessing the threshold to reduce the height of the weather-stop in relation to the interior finish floor. Have the exterior patio flooring lower than the weep-holes is required to allow proper drainage. 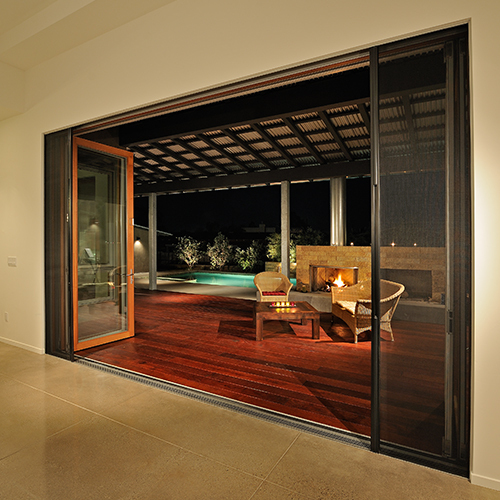 LaCantina Doors offers a threshold option specifically designed to weather seal against extreme weather conditions. This threshold option incorporates a bottom guide, weep system and weather-stop that is 3 5/16” on the inside. To minimize the height of the weather-stop, you can recess the threshold and/or build up the finished interior flooring. As with the standard threshold option, it is important that the exterior surface level is lower than the weep-holes to enable proper drainage. LaCantina Doors offers a flush floor threshold options with a bottom guide only, common for commercial applications. Installation with the bottom guide only is recommended for interior applications or openings without weather exposure. LaCantina Doors also offers a commercial flush floor threshold specifically designed to be ADA compliant. The commercial ADA threshold is recommended for applications or openings without weather exposure. Please note the flush floor options are not weather tested and no weather warranty is offered. For all threshold options, refer to the sill section details (by system type) in the technical resources section of the site under Architects and Designers. Does the daily passage door jamb panel swing 180 degrees around? The maximum swing of the daily door depends on your door configuration. When the daily door is hinged off the side jamb with our pivot hardware it will open approximately 120 degrees and does not swing back against the wall. When the daily door panel is hinged off another panel it can swing 180 degrees around in front of the adjacent panel. Do I have options for the lever handle? 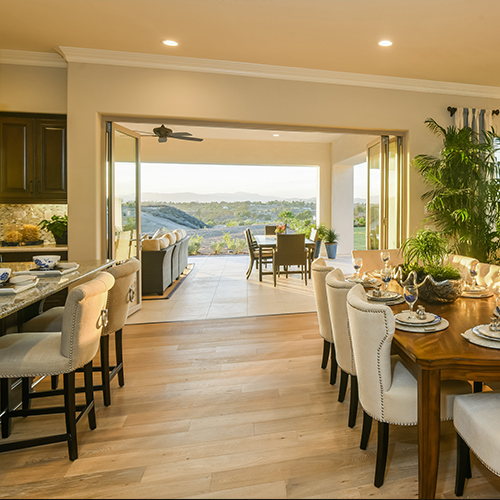 LaCantina Doors feature 3 styles of lever handles. The Aria handle is available only on Aluminum, Aluminum Thermally Controlled and Impact systems. The Summit handle is available only on the Aluminum Wood system. The Rodos handle is available only on Clad and Wood systems. Handle styles offered by other door manufacturers may also be compatible. Please contact us to obtain technical information. 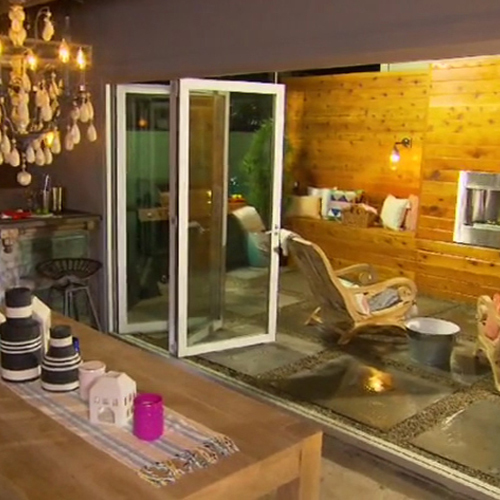 Are LaCantina Doors folding doors available in both outswing and inswing? We offer both outswing and inswing systems. Outswing is recommended if your doors are exposed to the weather. 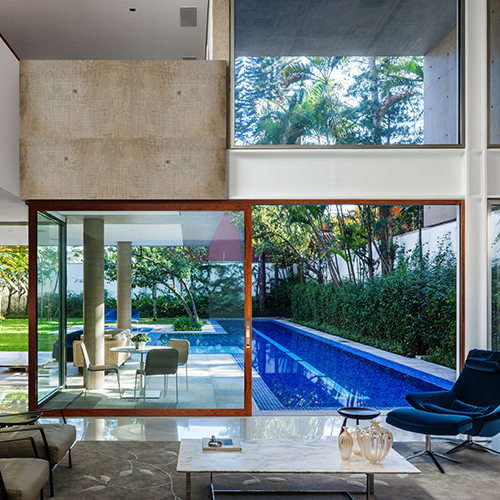 Swinging the panels to the outside also conserves your more valuable interior space. How do LaCantina Folding Systems lock when closed? Our LaCantina Folding Systems have surface mounted flush bolts are used both top and bottom to secure our Wood folding panels. Concealed multi-point locks with twin bolt levers secure Aluminum and Contemporary Clad folding panels. European-style door handles are provided on all systems with configurations that include a daily passage door. Keys are Schlage compatible and can be re-keyed. 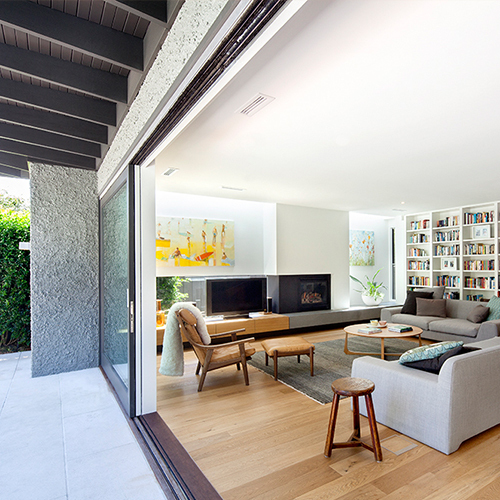 Does LaCantina Doors offer matching single or double doors? LaCantina Door systems are available in single and double door swing configurations that perfectly match our folding and sliding systems. Please contact us with your requirements or visit our Swing Door Systems product page. 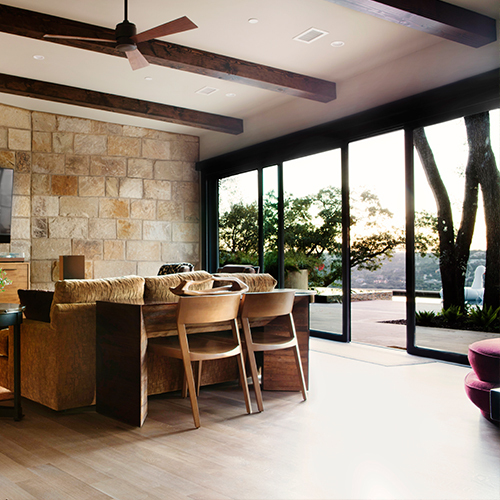 LaCantina Doors are available to purchase through our authorized dealers throughout many areas of the US and internationally. In areas not served by our authorize dealer, please contact us directly confirm your order and payment details. 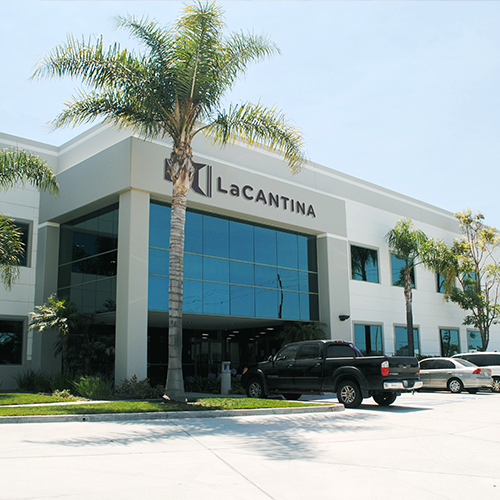 LaCantina Doors manufactures its own products and standard lead time is typically 5-7 weeks. Large quantities or custom (color) orders may take longer. If I have a pre-existing rough opening, how do I know what size to order? We recommend deducting 1” overall from both the width and height of your rough opening in order to determine the net frame size of your LaCantina Door. We accept orders based on your approved net frame size. Or simply add 1” overall to the net frame size ordered to determine your rough opening. Please take note on whether you will be recessing your threshold or not. How are La Cantina Doors crated and delivered? All our door systems are complete and ready for installation. Door panels with hardware attached are packed in a door crate. The frame is “KD” and in its own crate. We typically ship common carrier direct to jobsite or to one of our dealers for local delivery. Door panels are typically carried onto the jobsite individually and two people are needed to receive the order. How much does crating and shipping cost? We are located in San Diego, CA and generally ship common carrier outside of Southern California. Your crating and shipping cost depends on your location and the quantity of door systems and panels ordered. As a general guideline, crating and shipping is estimated at between 7-10%. All our door systems are shipped fully crated and insured. 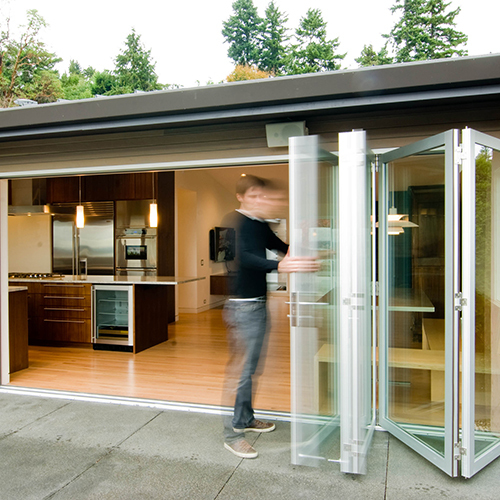 Who can install a LaCantina Doors folding door system? We supply installation instructions with all our doors and following these instructions is required for a correct install and to maintain product warranty. Installation or service work should only be performed by a suitably experienced professional. What type of structural support is required for LaCantina Folding Systems? LaCantina Folding Systems are top hung and provide superior operating performance. It is very important that the LaCantina Doors' frame be secured to an adequate header that does not deflect down when the doors are installed or if there is any settling in the structure. The structural support required and header size depends on both the weight of the doors and also surrounding structural conditions. The maximum deflection of the header with the live load shall not exceed the lesser of L/720 of the span and 1/4”. Structural support for lateral loads (both wind load and when the panels are stacked open) must be provided. For example, door panels 36” wide and 96” tall typically weigh approximately 110lbs each. We generally see engineered or steel beams used as headers. Please consult with your designer, structural engineer or contractor. 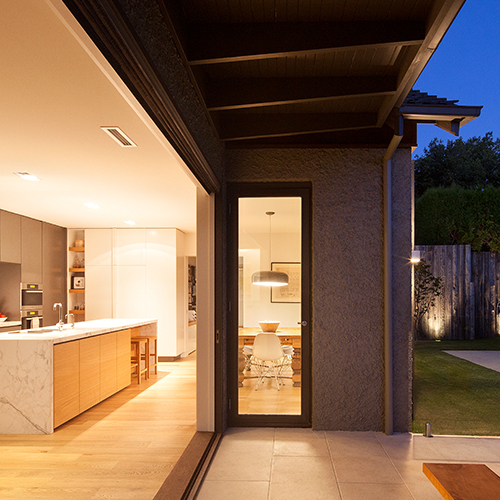 To ensure a successful LaCantina Doors installation, please follow these simple but essential guidelines. Have a rough opening that is square, a level floor and a rigid structural header. Depending on system size, individual panel weights generally range between 100-126 lbs. For top hung systems deflection of structural header should be no more than 1/8"
What type of adjustments can be made after the doors have been installed? Before making any adjustments, please contact your installer as they are responsible for adjustments and to ensure that it is not an install issue. After your doors have been installed properly, some simple adjustments still can be made if necessary. There are two points where you can adjust your system vertically and there are two points where you can adjust your system horizontally. Please click here and refer to page 8-11 of the homeowners manual for adjustments.